Henry Ford Hospital New Cancer Center, Parking Deck & South Campus Infrastructure – Testing Engineers & Consultants, inc.
TEC was retained to provide professional engineering consulting services for the new Cancer Center Pavilion, five-story parking structure, elevated pedestrian tunnel, and South Campus infrastructure. 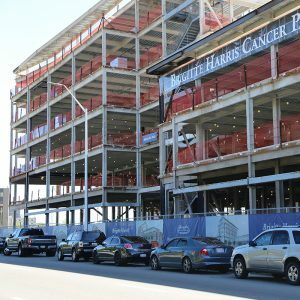 The Brigitte Harris Cancer Pavilion is a six-story, 187,000 square-foot pavilion designed by the SmithGroup JJR and is part of a 300-acre expansion and surrounding neighborhood redevelopment near the New Center area of Detroit. The Pavilion will be connected to the hospital via a skyway over West Grand Boulevard. Due to the size of the project and number of firms providing services, communication and project management are key components to the success of this project along with budget, document, and schedule management. TEC’s initial scope of work was to provide a geotechnical investigation to provide geotechnical design parameters for the Cancer Center and parking structure. The scope was expanded to include geotechnical engineering for the Skyway Pedestrian Bridge, as well as Construction Materials Testing (CMT) services for the development, and CMT and Environmental Services for the South Campus infrastructure project. TEC’s engineering services continued with analysis and recommendations for the crane pad and peer review of the contractor’s temporary earth retention system (TERs) design. TEC also provided vibration monitoring services driving of H-pile for TERs. Construction testing and inspection included concrete, density, site and utility backfill compaction testing, foundation inspection, concrete inspection, sampling and testing, structural steel inspection, masonry construction, roofing/waterproofing, bituminous paving, and engineering services. Environmental services included soil sampling and laboratory testing and analysis for volatile organic compounds (VOCs), semi-volatile organic compounds (SVOCs), and Michigan 10 Metals via the Toxicity Characteristic Leaching Procedure (TCLP), and total polychlorinated biphenyls (PCBs). TEC developed and implemented a monitoring program as well as Environmental Health and Safety parameters to address potential contaminants and worker exposure during excavation and below ground construction activities. As a woman-owned business founded in 1966, our goal is to support our diverse client base through every phase of their project while focusing on their overall success.